OSWEGO, NY – Two arrests have been made as a result of the investigation into three suspected heroin overdoses that occurred during the early morning hours of Saturday May 10 within the city of Oswego. It is alleged that on May 9 into May 10, Tumolo did knowingly and unlawfully sell heroin, a narcotic drug, to two separate individuals, one being Gabriel A. Gonzalez, within the city of Oswego. It is further alleged that those two individuals are suspected to have ultimately overdosed on the heroin. Both of those individuals were treated at Oswego Hospital and released. Oswego City Police additionally seized 40 bags of heroin that Tumolo allegedly possessed with the intent to sell. Tumolo was arraigned in Oswego City Court and remanded to the Oswego County Correctional Facility in lieu of $10,000 cash bail or $20,000 bail bond. He has a return court date of May 27 at 9:30 a.m.
Gabriel A. Gonzalez, 22, of 226 Anton St., Bridgeport, Conn., was arrested and charged with the following: Criminal Sale of a Controlled Substance in the 3rd degree- Class B Felony. It is alleged that on May 9, at approximately 6 p.m., Gonzalez did knowingly and unlawfully sell heroin, he had allegedly received from Tumolo, to an individual within the city of Oswego. That individual was located on the SUNY Oswego campus and ultimately died from what is preliminarily believed to be a heroin overdose. Gonzalez is currently being held pending his arraignment in Oswego City Court. 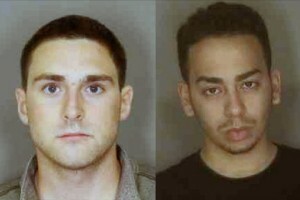 Throughout this investigation the Oswego City Police Department worked closely with the University Police at SUNY Oswego.